We thank you for all your support! We are truly grateful for the overwhelming response to the sale and our tv appearance! Please know that we are working very hard in getting your packages out but it will take a bit more time than usual. Thank you all for your patience and understanding! Hey guys! Just stopping by the Mama Elephant blog today to share a card I made with the new set True Friend! Every release, Kryssi and Angela comes up with at least one unique and fun sentiment set and this set is definitely it! This was one of those cards where I started with the sentiment and worked backwards. Do you all do that too? 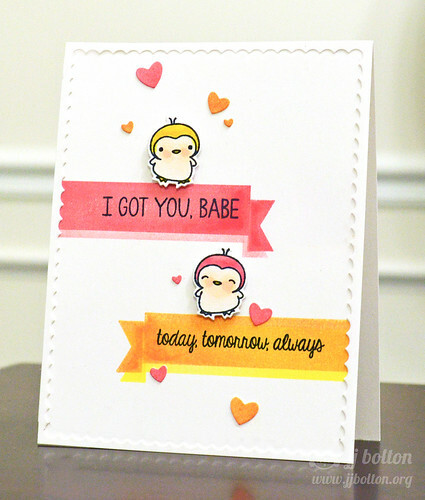 I just couldn't resist that "I got you, babe" stamp. (Showing my age, shhhh!!!) I started my card by stamping the banners twice with coordinating inks. The pink banner was stamped with lollipop over blush and the yellow banner was done with orangeade over sunny. To give the banners a bit of depth, I used these blending sticks to do a little shading. 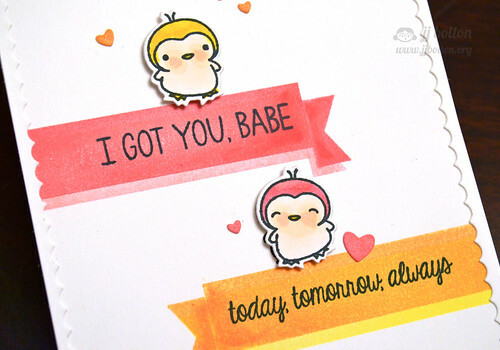 Then I stamped my favorite birdies from Love Quotes and colored them with matching markers. I cut them out with the matching dies and popped them over the banners. That’s it for me! Thank you so much for taking a peek:) Hope everyone is having a fantastic week! Beautiful card, love the ink banners! so adorable!! i LOVE the edge of the card!! (perfect use of the 'throw away' part!! ha ha!) and those little birds couldn't be more cute if they tried!! LOVE them in the bright, happy colors!! This is adorable! Love every single bit of it! Adorable love the colors and of course sentiments are perfect have a great day! So adorable!!! Love the colors and the characters! So cute, love those sweet birds! Wow so adorable and love those sentiment banners. These are SOOO cute! I need this stamp set so badly!